Tokyo, July 15, 2014 – Mitsubishi Heavy Industries, Ltd. (MHI) has received an order for a world’s largest post combustion CO2 capture system for the enhanced oil recovery (EOR) project in Texas, the U.S.A., which is primarily promoted by NRG Energy, Inc., an independent power producer (IPP) of the U.S., and JX Nippon Oil & Gas Exploration Corporation (JX Nippon), a JX Group company of Japan. The system will capture CO2 from flue gas from an existing coal-fired power generation plant and will have a CO2 capture capacity of 4,776 metric tons per day (mtpd). The system is slated for completion in the fourth quarter of 2016. MHI received the CO2 capture system order from Petra Nova CCS I LLC, a special purpose company (SPC) of NRG and one of the companies implementing the project, through Mitsubishi Heavy Industries America, Inc. (MHIA), a wholly owned subsidiary of MHI in the U.S.A. The consortium partner of MHIA in receiving order from Petra Nova CCS I is TIC – The Industrial Company, a heavy industrial contractor. JX Nippon has participated in the project by purchasing a 50% membership interests of Petra Nova Parish Holding LLC, the company that previously owned all the membership interests of Petra Nova CCS I. The EOR project involves the separation and capture of CO2 from flue gas emitted from Unit 8 of NRG’s WA Parish generation station, a coal-fired power generation plant, located approximately 60 kilometers southwest of Houston, Texas, and injection of the CO2 into nearby West Ranch oil field to boost crude oil production. The CO2 capture system will consist of a flue-gas quencher, absorber and regeneration system, CO2 compression unit, and utility facilities. It will have a CO2 capture efficiency of 90%*. MHI will license CO2 capture technology to Petra Nova CCS I through MHIA. The MHIA/TIC consortium will undertake engineering, procurement and construction (EPC) of the CO2 capture system and its ancillary facilities. MHI’s CO2 capture technology is the KM CDR Process®, which uses a proprietary KS-1™ high-performance solvent for CO2 absorption and desorption that was jointly developed by MHI and the Kansai Electric Power Co., Inc. Compared with other CO2 capture technologies, the KM CDR Process® uses significantly less energy. Its outstanding performance is highly regarded, and the process has been adopted in many CO2 capture plants in Japan and abroad, making MHI the leader in this industry. In the area of CO2 capture from coal-fired flue gas, which requires highly sophisticated technology due to various impurities contained in the flue gas, MHI has already established an impressive track record. For instance, MHI has conducted small-scale demonstration testing for CO2 capture from coal-fired flue gas at 10 mtpd since 2006, in cooperation with Electric Power Development Co., Ltd. (J-POWER) and completed the verification of uninterrupted table operations. More recently, the 500 mtpd CO2 capture demonstration test for capturing and sequestering CO2 from emissions at a coal-fired power generation plant, conducted jointly by MHI and Southern Company Services, Inc. (SCS), was completed in December last year, achieving initial phase targets. Based on these results, MHI has been promoting its commercial applications. MHI believes that its track record is gaining wider recognition within the industry and proved instrumental in the latest order for this world’s largest flue gas CO2 capture system for an existing coal-fired power generation plant. EOR projects, including the project related to this order, are advanced solutions, which concurrently address issues in both environment and energy fields. MHI will participate in this meaningful EOR project, enabling stable operation of the CO2 capture system. Going forward, MHI intends to continue its support of sustainable environment preservation and economic development through its aggressive involvement in this field. Note: CO2 capture efficiency indicates the ratio (percentage) of CO2 recovered from the flue gas by the process against total amount of CO2 contained in the flue gas. Two Japanese firms are joining hands in a project to use captured CO2 emissions to boost oil production in the United States. They say it will be one of the biggest projects of its kind in the world. Executives of JX Nippon Oil & Gas Exploration and Mitsubishi Heavy Industries announced that their companies will build a CO2 capture system in the state of Texas. They plan to invest about 1 billion dollars for the project and start operating the system in 2 years. The system works by capturing CO2 emissions from an existing coal-fired power plant and transporting it by a pipeline to an oil field. 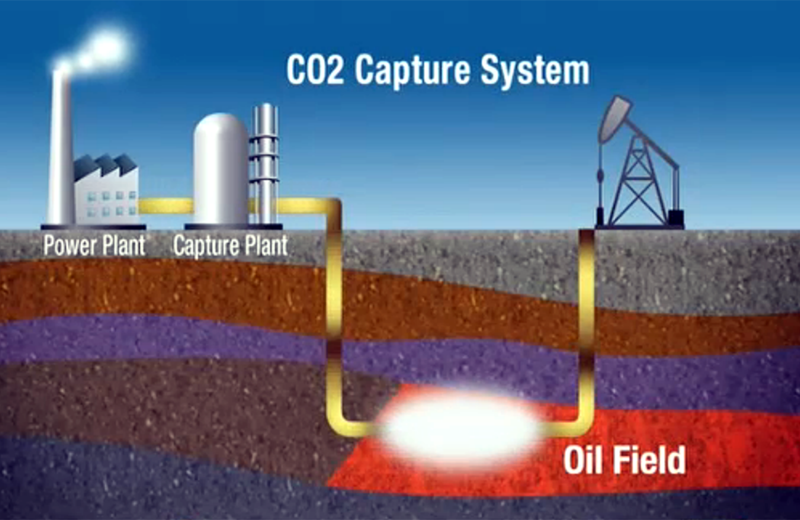 The CO2 is then injected into the ground to stimulate oil production. The executives say the project will boost output 24 times the current level. The volume of CO2 recovered will be equivalent to the amount produced from 200,000 hectares of forests. That’s about the size of the metropolis of Tokyo. JX Nippon Oil & Gas Exploration President Shunsaku Miyake says the project will contribute to recovering limited energy resources and addressing the issue of global warming.